Applications are invited from Pakistani Nationals for to fill in Vacant Post on Contract Basis for the duration of initially one year in Shaheed Benazir Bhutto University. 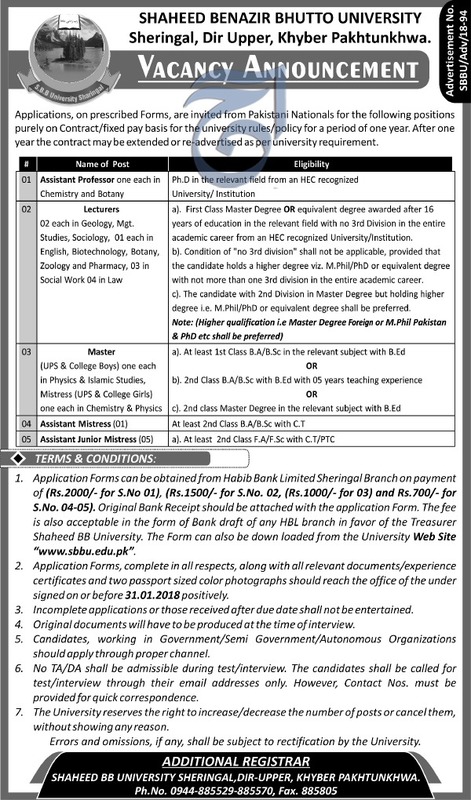 Interested Candidates fulfilling the required Criteria may apply for New Government Jobs 2018 by downloading from university website www.sbbu.edu.pk. Candidates who meet the criteria can apply for Assistant Professor, Lectures, Master, Assistant Mistress, and Assistant Junior Mistress.